Volkswagen's staggered rollout of its seventh-generation Golf compact hatchback makes it a little tricky to determine what you'll see when you walk into North American dealer showrooms in 2014, but here's what we currently know. The German automaker unveiled the new Golf to North American buyers at the New York International Auto Show in 2013, following its worldwide debut at the Paris Motor Show in late 2012. It subsequently went on sale in Europe, with its appearance on North American shores delayed about a year. The latest word says a limited number of seventh-generation Golfs will be available in U.S. showrooms in 2014, although they will be badged as 2015 models. And more than likely, a number of sixth-generation Golfs will continue to be available into 2014, resulting in a mixture of generations on showroom floors. No word yet on whether there will be an official 2014 Golf, but more than likely the automaker will skip a year, jumping right to the 2015 model year. 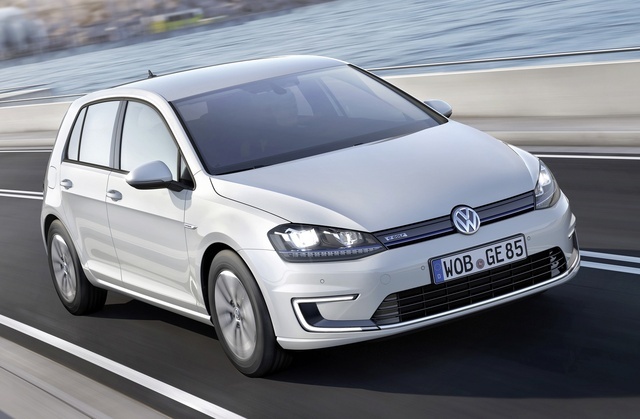 In addition, Volkswagen recently announced it plans to offer its first electric-powered Golf, called the e-Golf, to North American buyers by late 2014, although those also will likely be tagged for the 2015 model year. So, bottom line for buyers in the U.S., Canada and Mexico, if you want a new 2014 VW Golf, you'll have to head to Europe, or cool your heels until the Golf finally makes its appearance here on our shores. When it finally does roll out, the new seventh-generation Golf will be larger and more spacious, yet lighter and more fuel-efficient, than the car it replaces. It stretches 2.2 inches longer than the current Golf and 0.5 inches wider. In addition, it sits 1.1 inches lower, which helps to improve aerodynamics and fuel efficiency. Inside, VW says the new Golf has an additional 0.6 inches of legroom and 1.2 inches of shoulder room in the rear seat, resulting in a more comfortable ride for second-row passengers. VW will replace the current generation's base 2.5-liter 5-cylinder engine with a new turbocharged 1.8-liter 4-cylinder engine with direct injection. It delivers 170 hp (the same as the previous engine) and 184 lb-ft of torque, up 7 lb-ft from the previous engine's 177 lb-ft and peaking at a lower rpm. As a result, the new Golf should have more spirited acceleration than the current version. The gas engine links to either a 5-speed manual transmission or a 6-speed automatic with Tiptronic manual-shift and Sport modes. VW says the new engine will boost fuel economy numbers by 15 percent over the current version, which check in at 23 mpg city/33 highway with the manual shifter and 24/31 with the automatic. As in previous years, the automaker will offer PZEV (Partial Zero Emissions Vehicle) versions of the gas-powered trims for sale in states with California emissions standards. VW will also offer the new Golf with a diesel powerplant, in this case a new turbocharged TDI 4-cylinder engine, also with direct injection. It produces 150 hp, a boost of 10 hp over the current diesel engine. Torque remains the same at 236 lb-ft. Low-friction components and a new 2-stage oil pump help improve fuel economy numbers, which currently check in at 30/42 mpg, although VW has not yet released specific numbers. As in the current version, the TDI engine mates to either a 6-speed manual transmission or a 6-speed DSG automatic with paddle shifters for manual shifting. Chassis and suspension updates for the new front-wheel-drive Golf include a standard XDS electronic differential lock, borrowed from the current Golf GTI. In the event of wheel slippage, the system automatically sends extra torque to the front wheel with the most traction, improving road grip and handling. The new Golf also gets progressive steering as a new standard feature. It provides tighter steering in turns and less effort at lower speeds. Outside, the new Golf borrows some styling cues from the current Golf, including the design of the side windows, roofline and wheel arches, but displays better proportions, in part because the front wheels have moved forward by 1.7 inches. This helps push the cabin back on the platform, giving the new Golf a more upscale look. The front end gets a complete makeover, and features a narrower grille with chrome bars and a sloping hood without the fender peaks of the current generation. The headlights and taillights get revised as well, and the tailgate at the rear has a lower load height. Overall, the new Golf looks longer, lower and more aggressive than the current version. In addition to having more rear-seat room inside, the new Golf offers more cargo space, which increases by 8 percent. VW adds underfloor storage in the rear for the new generation, and there are now numerous storage spaces and cubbies throughout the cabin, including 6 cupholders and a sliding tray under the driver's seat. To improve ergonomics, the driver's seat has been shifted back by almost an inch and the shift knob sits higher, making it more accessible. The center console now angles toward the driver and includes a 5.8-inch infotainment touchscreen with a proximity sensor, which enables drivers to change functions with a swiping motion, similar to a smartphone. New soft-touch surfaces, as well as chrome, aluminum and piano black trims, give the cabin a higher-quality feel. New lighting for buttons and switches also provides a premium appearance. As far as safety features are concerned, the current Golf was named a Top Safety Pick by the IIHS, and more than likely the new version will carry forth that tradition. By all accounts, the new seventh-generation Golf will be a big improvement over the current version, but that shouldn't take away from the solid design and performance of the sixth generation. The current Golf has received high marks from critics and owners alike for its comfortable interior and solid list of standard features, as well as its good performance and handling. Fuel economy numbers remain a downside for the current version, especially with some competitors posting numbers in the high 30s, but the current Golf remains a good buy, and as it rolls into its final days, it's definitely worth keeping an eye on, especially if dealers start offering good deals in order to clear their lots ahead of the arrival of the seventh generation. What's your take on the 2014 Volkswagen Golf? 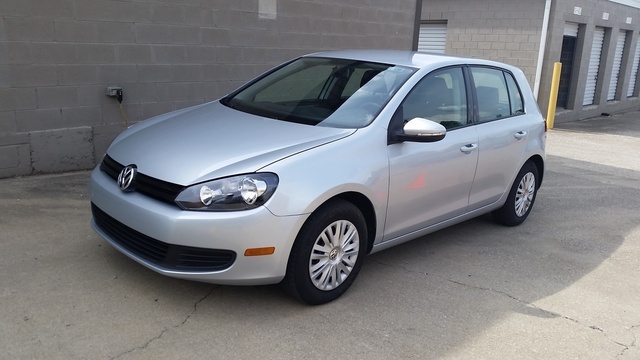 Have you driven a 2014 Volkswagen Golf? Best cat-back exhaust for 2014 Vw golf tdi?